"Excellent and informative. A well-written, fascinating look at day-to-day life in a nation on the brink of collapse"
"B.A.K. Sim's eloquent descriptive writing draws you into a thrilling yet unnerving and astonishing journey in Zimbabwe during the financial collapse, rampant hyper-inflation and dependence on the black market and a .38 caliber for survival, ultimately ending with a harrowing escape." Start reading Double Rainbow at Full Moon on your Kindle in under a minute. The book is obviously true history. The author is authentic describing the brutal events as well as the human elements of the daily living. She is sensitive and one really does feel how she is not just battling the war between the black government against the white residents, but also is fighting the battle of her husband's cancer simultaneously escaping Zimbabwe. She must be a a very strong and fearless woman having conquered both, while most people would have died! God bless this unusual couple and may her philosophical believes flourish.! 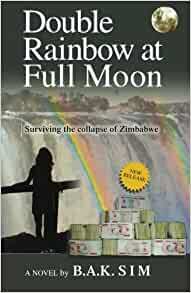 This book is a MUST read not only for Zimbabweans but for the world to see what happened to a marvelous country. It is a very good, accurate account of what actually happened during those hyperinflation days. Hard to believe unless you were there on a day to day basis. Once started I could not put it down, it brought back so many memories, well written. Glad that those tough times have been recorded and committed to print. Thanks Dila. After living in Zimbabwe from 1994 to 1997 I can understand how this book has brought forth the truth of the downfall of Zimbabwe. I currently see the same trend happening in Denmark although on a much slower pace. The experience from this book tells the world that the same could happen in the West.It is a real life educational read with a strong human element. If you were ever a citizen of Rhodesia and left before the fall which is now Zimbabwe this is a must read. Anybody who has heard of the conditions in Zimbabwe, and who hasn't, this will give you a better look at how it was by someone who lived through it. These people supported the ruling government and tried to make a difference only to be betrayed.